Everything came very carefully packed and with a sweet note. 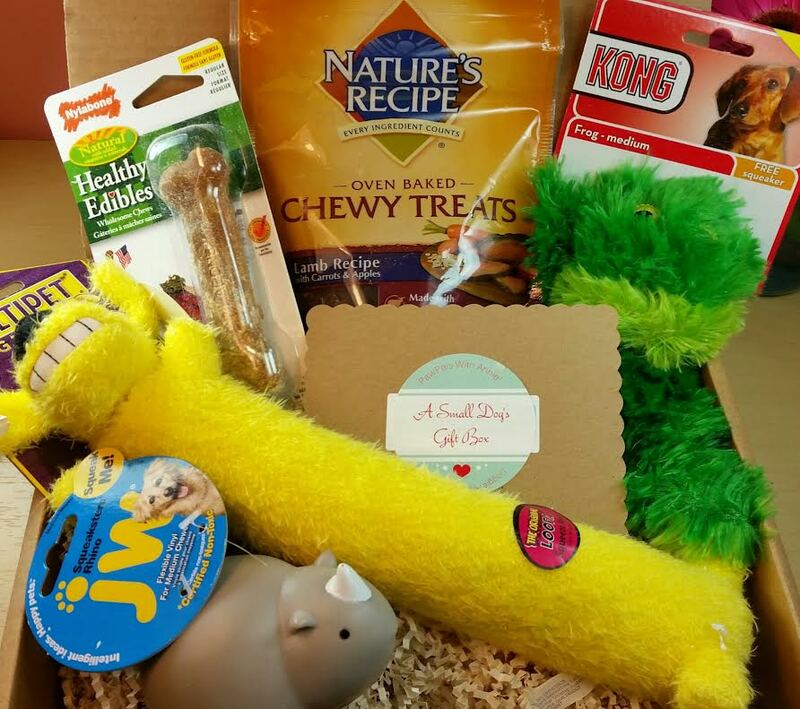 I have to tell you that even though this box is for my dog, it's really also for me and I loved having to dig through and find out what I received! Honestly, I don't get a lot of boxes that are a complete surprise but when PawPals with Annie sends a Gift Box, you really will feel like it's a gift. 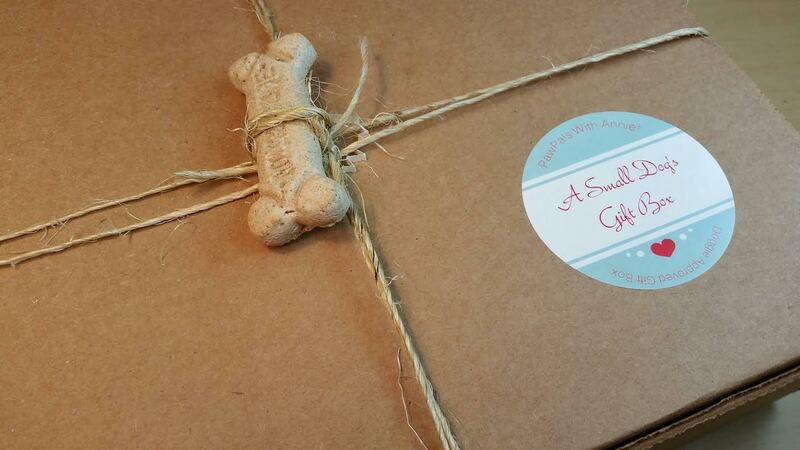 If I had a friend who sent my dog a box like this, I'd probably love them even more than I already do. 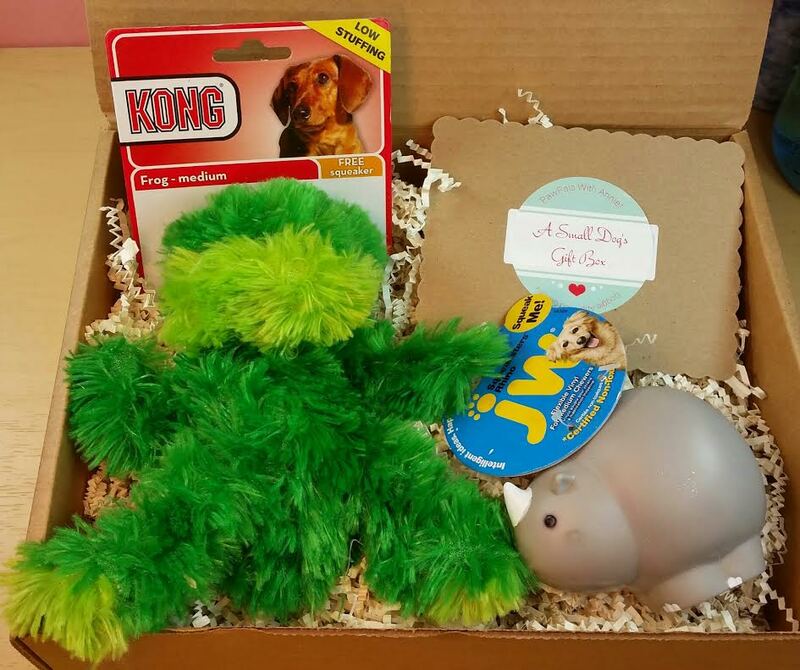 Because it takes a certain type of awesome to send someone else's dog a gift. Hm... writing that just gave me an awesome idea. Nature's Recipe Oven Baked Chewy Treats in Lamb- This is perfect for us because Dexter is allergic to chicken. I'm always so happy when we get a treat with no chicken in it! These are actually great training treats as well because they aren't crumbly even though they're soft and they're a nice size. Not pocket tiny but a good size for holding a few in your hand to work on tricks. Kong Frog in Medium- This is so perfect! We've never actually gotten a Kong toy in any of our dog boxes before! And that's a lot of dog boxes, too. I'm super excited to see this brand included because it's one that tends to hold up really well against teeth and intentional dismemberment. This actually came with an extra squeaker inside a velcro opening in the back. Bugsy has played with this toy every day since we got this box and while he managed to kill the squeaker, he did not actually get it out of the head. I had removed the extra one but I'm going to put it in later, to surprise him. I actually want to run out and get a couple more of these because they went over so well and are comparatively sturdy. JW Squeaker Rhino- This is a hard vinyl toy for Medium chewers. I think my dogs are hard chewers but Bugsy loved this toy, too. It's the perfect size for his mouth. It did squeak when we got it but the first thing he did was chew off the little rhino horn which caused it to no longer squeak. This did not deter Bugsy and he continued to beg for this to be thrown for him. I was surprised he liked it at all because I'm not used to giving him hard plastic toys like this. Multipet Dog Toy Loofa Pet- I think Bugsy's head exploded with the amount of toys he got in this box. While Dexter likes hard bones and food related goodies, Bugsy is definitely more into the toys. In fact, he didn't even want the treat I was trying to give him because he was too busy trying to get all his toys in his mouth at the same time. This is a long, fuzzy toy with two squeakers in it. Or rather, it arrived with two squeakers but they are no longer in residence. However that doesn't prevent him from continuing to play with the "leftovers." I don't know why he loves squeakers so much but they definitely keep him occupied. 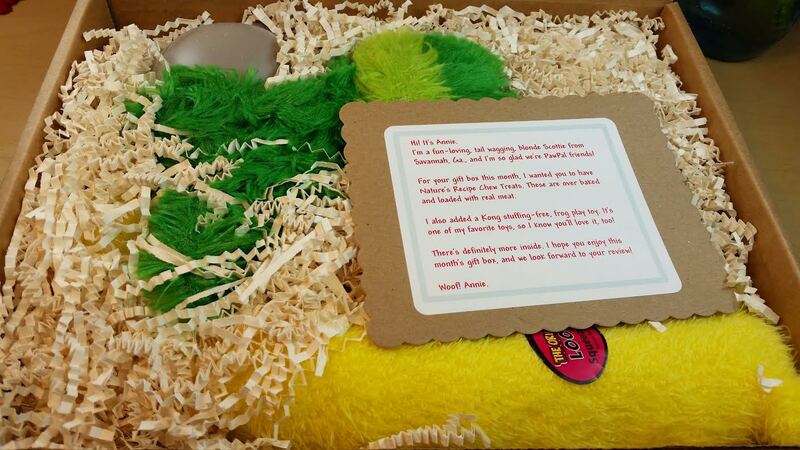 VERDICT: Since each PawPals with Annie Box is personalized, I can't say I know what you will get but I know I loved what came in this particular one. I loved that it arrived like a gift with a little bone tied on top of the package. I loved digging through to see what we received. Most of all, I was so happy with how much both dogs enjoyed what was packed inside. As with most boxes for pets, the box comes right in at the price paid value. For me, I love the variety of curation because it gives my dogs something new to do each month. New toys means more things to keep them occupied and not barking at the mailman. Yeah, right. They see the mailman nearly every day and they still bark at him. It also means I don't have to make a trip to the store to pick out toys. Part of the fun is that I would never choose some of these toys for my dogs on my own. I never would have thought Bugsy would love a floppy frog so much! Now I've already bought another one because he loved it so much. So when the first one bites the inevitable dust, I'll have another one for him. I figure $30 a month is worth that. I'd spend that or probably more picking out toys for them each month anyway except this way I don't have to go out! If this is what you've been looking for, you can sign up at www.pawpalswithannie.com. 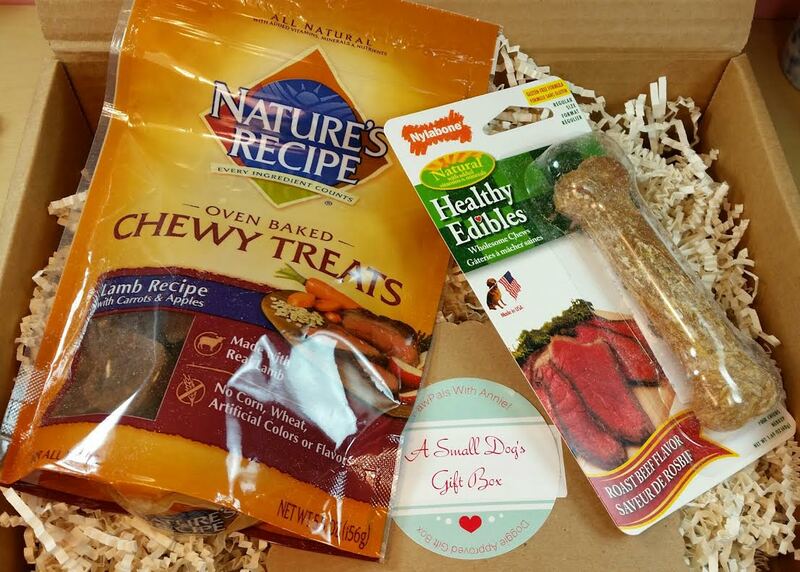 Use code Dogbox to get $5 off your box! 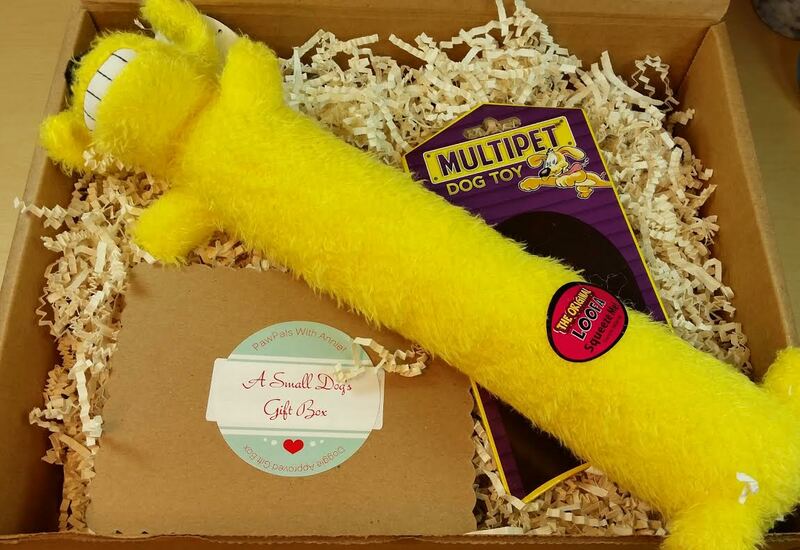 And don't forget this would make an awesome gift for a dog lover! If you have a very small or very large dog, you may want to contact them first and see if they have stock that would be appropriate because it looks like the size options are currently for small dogs as 20lbs or less, medium dogs as 20 to 40lbs, and large dogs as 40lbs or more. 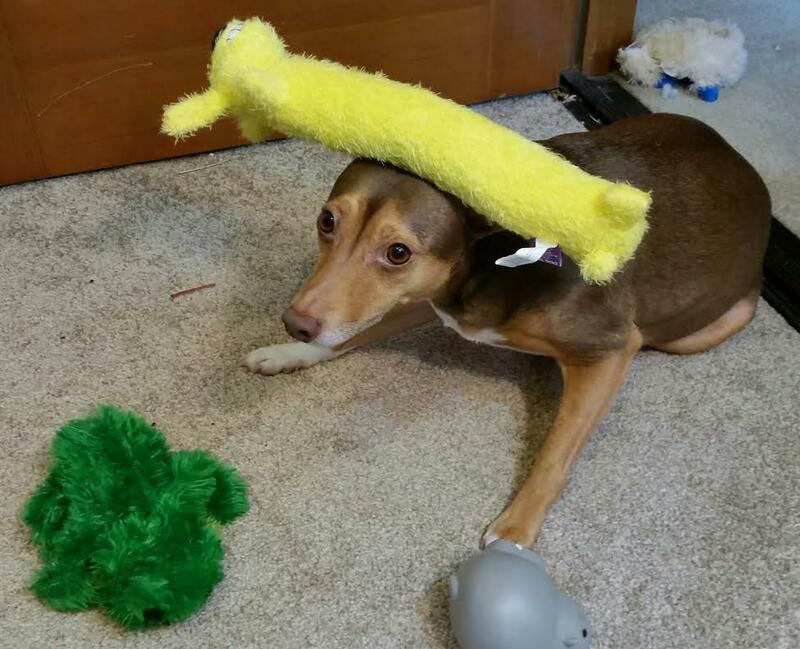 This is Bugsy with his toy stash. I'm serious. He actually was trying to get all three of these toys in his mouth at once. The plastic rhino foiled his plans every time. Haha! I actually can't believe I managed to get him still enough for a photo. He was ridiculously excited. 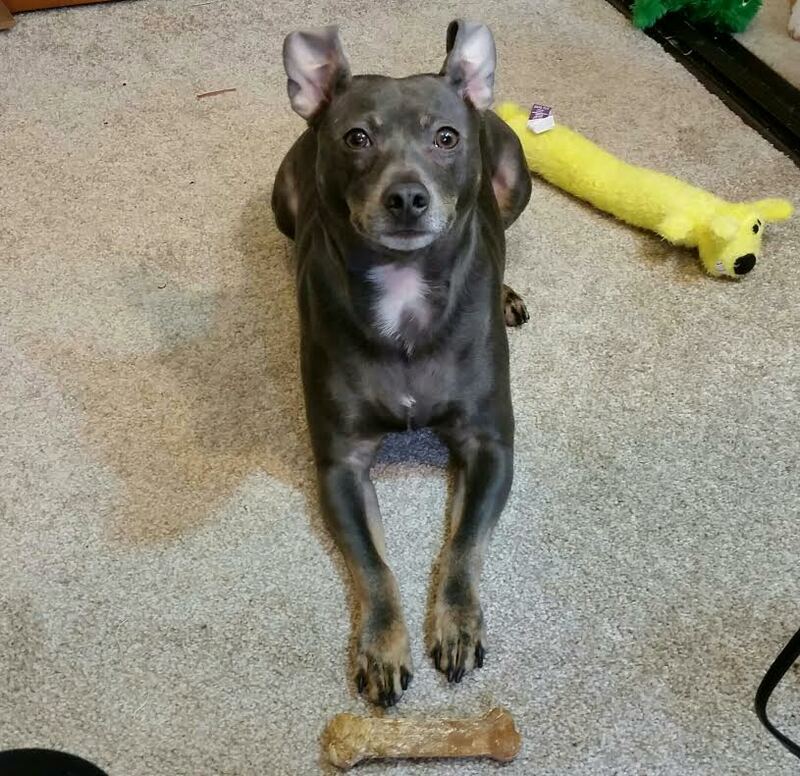 Here is Dexter being a good boy and doing a "down, wait" for that Nylabone Edible bone. What you can't see is that Bugsy is behind him squeaking his toy for all it's worth. Dexter was not happy about this because he wanted to "guard" his bone. That's not allowed. No guarding. So he has to wait. I think he's pretty cute but I could be biased. What do you think of PawPals with Annie? I really am impressed with the brand list, I have to admit. The curation was excellent and each toy was a different type which is great, especially for multi-dog homes. I know my dogs have their preferences and I'm sure others do, too, so it's nice to see a range that can potentially please everyone. *This box was provided to me for review purposes. All opinions are completely my own. I saw the review on YouDidWhatWithYourWiener.com and immediately checked Annie out. I then sent a 3 month subscription to my friend for her senior JRT. He loved his first box. He is Calvin - featured on Annie's FB page. Your review is even more in depth - my Justus (65# hound/dogie/? mix) LOVES squeakers - he will take a squeaker over food any day. I look forward to getting him a box soon. I saw that review, too!! I was so curious since it's such a new box but I was so pleased with the contents that I'm going to send one to my friends dogs because she'll love it (and so will her dogs). Dogs are so great, I just love the personalities. I'm happy when my dogs are happy and the contents of this box are still keeping them busy! I hope you love your box, too, when you get it!